Colors revive the mind, body and soul and it also saps your energies. Have you ever worn one of your favorite colored nursing uniforms and it lifts the mood of your coworkers and patients as they see you? You get a lot of compliments and you feel happy and they feel happy. Everyone’s happy! There is truth to the energies that colors emit and there is no escaping them as they are all around you. Guys traditionally wear dark colors and women wear all colors and prints depending on their personality and mood. These two things influence your choices in choosing your scrubs and sometimes they conflict with each other. Colors are a powerful communication tool and it is therapeutic as well as expressive. It is Spring time and a lot of yellows, pinks, oranges, bright shades of greens and blues will be worn as well as purple which is a trendy color this season for nursing scrubs. So what does each color mean? 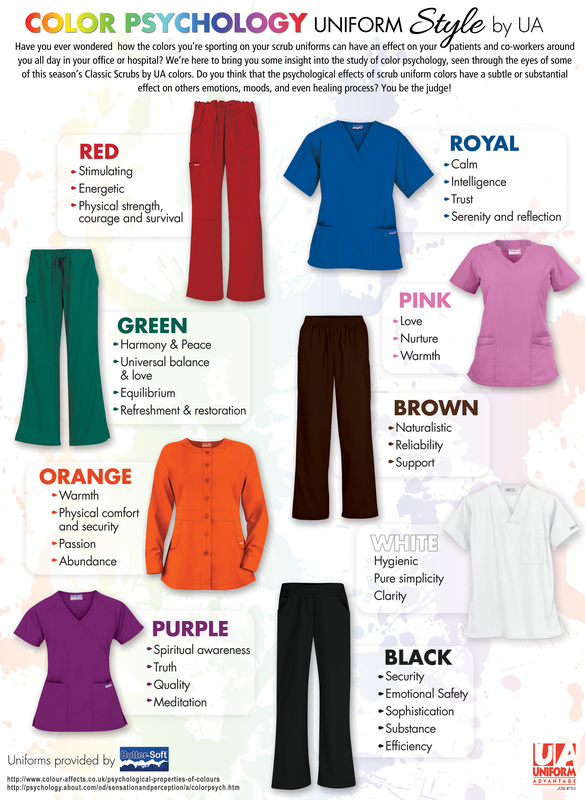 Check out Uniform Advantage’s Color Psychology guide to help you choose your nursing uniforms. Red is stimulating, energetic and represents survival. Royal Blue is calm, trusting and reflective. Green represents harmony and peace and refreshment and restoration. Pink is all about love, nurture and warmth. Brown is naturalistic, reliable and supportive. Orange is also a warm color and represents passion and abundance. White is hygienic and simple. Purple is meditative, spiritually aware and truthful. Black shows security, represents sophistication and efficiency. What is your #favorite color and why? Leave us a comment. We would love to hear from you!